Prime Minister Voreqe Bainimarama has slammed the so-called Islamic State (ISIS) for its terrorists attack. Delivering the keynote address at the ACP (African, Caribbean and Pacific) Council of Ministers in Brussels, he said – “We gather here today – the nations of Africa, the Caribbean and the Pacific – in friendship and solidarity. And especially in solidarity with the people of France, who are mourning the 130 people who were killed in the terrorist attacks eleven days ago. He said they also expressed solidarity with Belgium, as its people also faced down the terrorist threat. 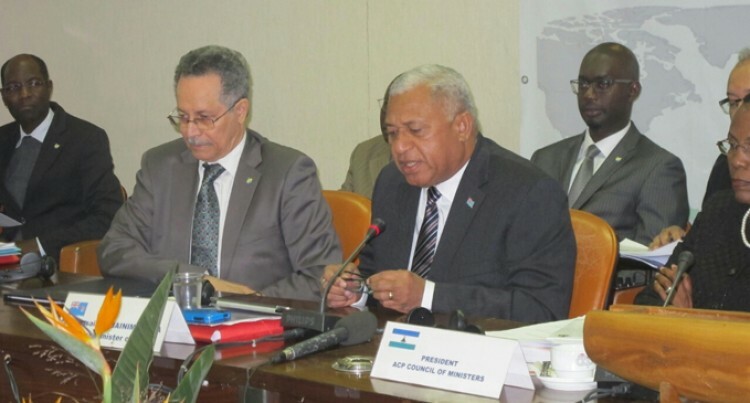 Fiji, he said, condemned these atrocities in the strongest possible terms. He said Fiji would do everything it could to contribute to the global opposition to terrorism. Mr Bainimarama said there is no excuse for these acts of terror and especially in the name of God. He said this was not God’s way. The destructive nature of Islamic State – its manipulation of religion to justify its murderous rampages, its suppression and exploitation of the people under its control and its celebration of death, he said, was in stark contrast to the nobility of the ACP organisation. He said while the ACP organisation enhanced lives Islamic State and other terrorist groups took them. They (ACP) created opportunities while they destroyed it. They brought people of different backgrounds together to celebrate their common humanity while they advocated division and hatred. The Prime Minister said in our patient collaboration lay the answer to the world’s challenges while IS were a death cult that revelled in misery and mass murder. He said the ACP had survived as an organisation for 40 years and were planning even greater co-operation in the years ahead. He said IS’s days were numbered because they offered nothing but the blood of innocents and blaspheme – the word of God; twisted to justify the unjustifiable. Meanwhile, he also welcomed ACP’s 80th member, South Sudan.